There is a story about the making of Steven Spielberg’s “Jaws” which is something of an interesting tale about the kind of stress and strangeness that goes along with the filmmaking process. As actor Richard Dreyfuss had finished his part, the production had already been through several obstacles, one of which was the electronic model of the shark not working. Stressed and eager to go home, he took the plane home only to find the familiar face of Spielberg sitting only a few seats from him. When the actor asked the director why he was leaving the crew, Spielberg apparently told him he simply had enough and thought the rest of the filming would work just fine without him. Although an anecdote such as this may be exaggerated at times, and in retrospect highlight or even romanticize the production of a film, in reality the process takes its toll on those involved, something which audiences do not see in the finished product and in the often glossy extra features put on physical media. However, it is exactly this kind of process which is at the core of Shûichi Okita’s “The Woodsman and the Rain”. The director whose features such as “A Story of Yonnosuke” or “Mori, The Artist’s Habitat” have repeatedly presented the repercussions of events or people on the lives of others as well as discussed the role of the artist within society. In a small mountain village, Katsuhiko (Kôji Yakusho) lives a quiet, but often lonely life. 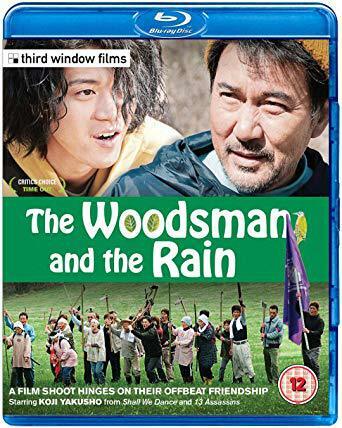 After his wife’s death nearly two years ago, his life had become a routine for him divided between his work as a woodsman and regular arguments with his son Koichi (Kengo Kôra) about his future. 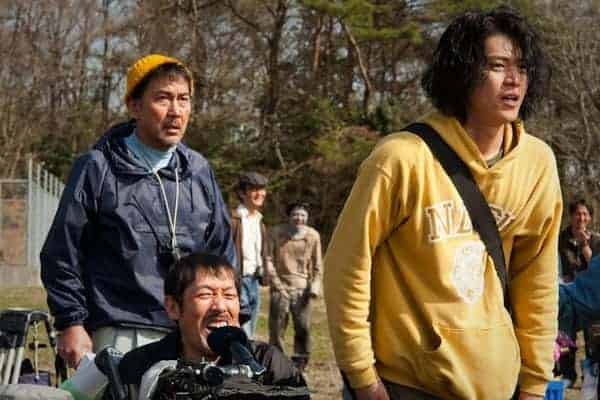 However, this routine changes as a film crew arrives in the village to shoot a zombie movie written by Koichi (Shun Oguri), who is also the director. By chance, Katsuhiko becomes involved in the production, first as a location scout and later on as an extra. He quickly notices the young director is overwhelmed with the task at hand, is unable to give direction and make decisions resulting in his cast and crew being frustrated, as well as the project being behind schedule. Even though Koichi tries his best to avoid the company of the outspoken Katsuhiko, the two men eventually find a liking to each other. And while the woodsman finds himself enjoying the busy filming process, the young director regains his confidence in the project. In general, “The Woodsman and the Rain” can be summed up as a story about regaining one’s voice. The two central characters suffer from their voice having disappeared, leading to a loss of confidence (Koichi) and an emotional distance to others, for example, in the relationship of Katsuhiko and his son. The images of Yuta Tsukinaga nearly always emphasize this growing gap between people, as their dialogues either take place over a certain distance or in oddly switched roles, for example, when Katsuhiko sits in the directing chair while Koichi sits just a few meters beside him on the ground. While this always leads to some humorous scenes, these images are often quite telling, especially as both never seem to care to take over the role they are supposed to. In another scene about the failure of taking over a role, Katsuhiko nearly ruins the rehearsal of a scene in Koichi’s film, because he does not understand the concept of being a zombie. Nevertheless, this is linked to the overall sense of missing communication between the characters. In a highly amusing segment, Okita seems to be making fun of the sometimes artsy and complicated way of expressing ideas. Instead of simply explaining the concept of a zombie, an assistant talks about creating “ambiguity” while Katsuhiko listens patiently, even though his expressions indicate he does not understand a single word. At other times, we see Koichi bombarded with an array of questions from his cinematographer, his cast and other members of the crew until he eventually breaks down burying both hands even deeper in the pockets of his hoodie. Overall, Okita’s film shows a well-timed approach to comedy and individual drama. Despite their oddities, neither Katsuhiko nor Koichi are portrayed as caricatures, but rather as individuals who have at one point decided not to take part in life any longer. Kôji Yakusho’s and Shun Oguri’s performances highlight the kind of dilemma of men eventually forced to clearly express their views, take responsibility and take over a role they have either neglected or not yet defined for themselves. Interestingly, Okita mirrors this kind of development on a much wider scale, as the whole village in the end becomes involved in the making of the film, leading to the image of pedestrians, students, conductors and housewives leaving on their zombie make-up as they go about their daily lives. “The Woodsman and the Rain” is an entertaining, humorous film, supported by a great cast and cinematography. Though a bit too long for its own good, the characters and their dialogues will certainly make this into a wonderfully odd viewing experience about taking over a role in your life. Because in the end, there is not question about whether you want to do something, you eventually have to. And sometimes this means talking to your family, communicating with your crew or walking in a river like a zombie.